The Jergens Replaceable Grippers are available in Hardened High Speed Tool Steel or with Carbide Inserts. The points of the grippers embed themselves into the work piece giving greater holding power with less actual pressure. 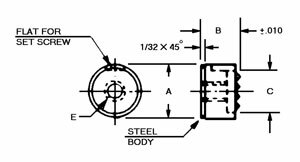 Jergens Grippers may be held in place using either a set screw on the flat of the gripper or the threaded hole in the back of the gripper. Use Jergens Grippers to make hardened serrated jaws from Jergens soft top jaws or add the grippers to Jergens strap clamps for extra holding power. Use Jergens replaceable grippers anywhere that rough surfaces are being held in position for machining.